A group of special children got the treat of a lifetime recently when were they invited to a party at Buckingham Palace hosted by Prince William, Princess Kate, and Prince Harry. 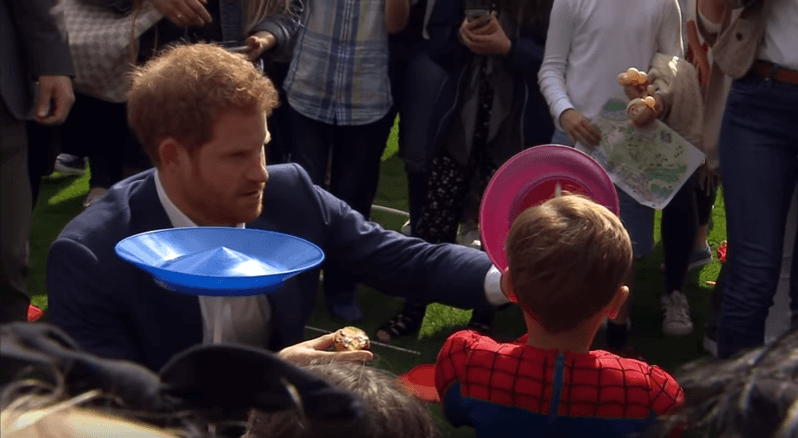 Full of fun activities like face painting, superhero costumes, a petting zoo, and much more, it was a once-in-a-lifetime chance for children to visit the garden and party alongside royals. And it definitely wasn’t the typical stodgy palace party, with Princess Kate even launching water balloons from a giant slingshot on the palace stairs. The 850 children in attendance definitely earned the chance for happiness and celebration, especially after facing grief and hardship so early in life—their parents were all service members who died while in the armed forces. The royal hosts wanted to acknowledge the pain the children have gone through at such young ages and provide them an opportunity to have fun and connect with other children and families who have gone through similar circumstances. Everyone in attendance was invited with a handwritten note from Prince Harry. “Today was organized to celebrate you guys. We’re here to remind you that we as a family, and as a nation will never, ever forget the sacrifices that all of you here have made,” said an emotional Prince Harry to the attendees. Prince William and Prince Harry know the effect of losing a parent at a young age, as they commemorate the 20th anniversary of the death of their mother, Princess Diana, this year. In addition to family members, there were also representatives in attendance from organizations that help children and families cope with loss, which Prince William and Prince Harry said would be especially helpful from their own experiences. The children moved through various stations around the palace grounds, which was transformed into a dream playground with activities like cake decorating, arts and crafts, and science experiments. The party also featured performances by top entertainers, including ventriloquist Nina Conti and singer Jess Glynne. The party was a smashing success for those in attendance, including the surviving parents of the children. “It means so much that the royals put this event on and are showing us their support,” said the mother of a boy whose father was killed in a 2013 London terrorist attack. Smiles throughout the garden showed that many children and parents felt the same way and enjoyed connecting with others and being able to feel like a normal child for at least one day. The end of the party features a special display by parachute display team the RAF Falcons, who parachuted over the palace roof into the gardens—a memorable finish to a spectacular day for the children.